Current US policy toward Iran has three facets of pettiness, ignorance, and arrogance. My criticism of the leadership style of Donald Trump, the new normal of abusive language in political rhetoric, and the arrogance and ignorance of the President and his Administration is well known. The President’s petty Obamaphobia and the hypocritical interpretation of historical facts is dangerous and self-indulgent. He has surrounded himself with washed-out neocons like John Bolton and, now, I’m just waiting for the rehabilitation of Paul Wolfowitz next. And now a Tea Partier is the Secretary of State. Mike Pompeo is highly qualified for many offices, perhaps the CIA, and perhaps even the Pentagon. The leader of the State Department ought to be a Warhawk. Yet, on May 21, 2018, the top diplomat of the United States of America said that the US will “crush” Iran. Crush? Is that now the new-normal for diplomatic parlance? From the White House Correspondents Dinner of 2011 to the campaign trail of Election 2016, it is apparent that the US President Donald Trump has a personal vendetta with all things Barrack Obama. No, it’s not even a policy disagreement, its personal Obamaphobia. The cornerstone of this Administration seems to be to dismantle the name Obama from the government as if the name was an interloper’s moniker on the side of a Trump Tower. Indeed, there seems to be little logic behind policy-reversals, just that the policies were ascribed to Obama… Obamacare anyone? From DACA, to Cuba, the Paris Accord and Net Neutrality, to off-shore drilling, Bears Ear, transgender bathrooms, and the Iran Agreement. Of course, an incoming president has the right and, as presidents from opposite political parties, perhaps the ideological interest in reversing policies. However, this Administration is obsessed with undoing policy at rates of speed and indifference to law more than prior administrations. While questionably legal, many on both sides of the aisle were relieved with the DACA policy because it removed Congressional responsibility for a legislative fix. The Republican-led Senate brokered a deal, only to have President Trump undermine the deal at the last minute. Was anyone outside Little Havana in Miami even complaining about the normalization of relations with Cuba? Then why change the policy… because it was done by Obama. Climate Change? Obama, so it was “undone” even though it is legally binding under international law. Article 4 of the Paris Accord reiterates the obligations already contained in Article 4 of the 1992 United Nations Framework Convention on Climate Change which became binding law after US Senate ratification in 1992. On Wednesday, May 16, 2018, the Republican-led Senate passed legislation to repeal Trump’s FCC decision by Trump’s appointees. President Trump lifted the off-shore drilling ban, even though the coastal governors of both political persuasions lobbied Trump not to reverse the ban. Even in the face of North Carolina’s gubernatorial election, Donald Trump’s Administration reversed the interpretation of Title IX regarding transgender bathrooms. Again, each incoming presidential administration has the right to make policy changes and reprioritize both domestic and international agendas. Presidents of both political parties have had a history of engaging with rogue states and terrorist organizations. Yet, hypocritically, some presidential candidates and presidents seem to only vilify engagements by presidents of the opposite political party. From the Iran Hostage Crisis to the Iran-Contra Deal, from the Reagan-Gorbachev Summits to the USS Stark cover-up, from Bush 41’s official acceptance of the Japanese apology for Pearl Harbor on December 7, 1991, to Bush’s continuation of pro-Iraq policies as NSD 26. And Clinton’s normalization of relations with Vietnam and his negotiations with the PLO in the Middle East as well as the IRA and UDA terrorist organizations in Northern Ireland. In 2004, President George W. Bush began the process of normalizing relations with Libya. Additionally, the Bush Administration used US funds to create the Sunni Awakening militias by essentially hiring the militiamen away from the Sunni uprising militias that had been attacking the US and Shi’a forces. The point is this: it is hypocritical and/or ignorant to denounce meeting and negotiation with rogue nations and terrorist organizations. It is a tool of diplomacy that has been used by US Presidents from both political parties. In fact, the current president seems as proud of his impending meeting with Kim Jung Un as he and others were critical of President Obama’s handshake with Raul Castro. Again, it is important to remember that the UN Treaty is binding US law based upon Article VI of the US Constitution and the ratification of the UN Treaty by the US Senate in 1945. And Chapter VI of this binding document requires negotiation and arbitration of international disputes, not one-sided ultimatums. US foreign policy for many decades has been a double standard, to say the least. American rhetoric often refers to the rule of law, yet the American government categorically ignored the decision in USA v. Nicaragua (1986). The more recent American use of drones as extrajudicial execution squads are as illegal internationally and, in the case of Anwar al-Awlaki and others, against domestic law as well. The US government often asserts national sovereignty as a bulwark defense of US policy and unilateral actions yet labels other sovereign states who assert the same supposition as rogue-nations. Either the Americans has the right to impose a unilateral economic blockade against Cuba and Iran has the right to develop nuclear technologies, or Iran does not have the right to develop nuclear technologies and the US does not have the right to unilaterally impose economic sanctions. Both are examples of national sovereignty. Either Iran must comply with international regimes and the US must comply with international regimes as well (again, like USA v. Nicaragua), or international regimes are not compulsory on either nation-state. If the US government can arbitrarily withdraw from international treaties such as the US Small Weapons Ban, Kyoto Protocol, the Rome Statute, NAFTA, the Paris Accord, the Iran Agreement… If the United States can withdraw from international agreements, then is there any reason for Iran to stay party to the Treaty on the Non-Proliferation of Nuclear Weapons? Iran can hardly be held in violation to an agreement that the government has withdrawn from, right? What is the incentive for Iran to stay a party to the NPT? Yes, there is a clear, non-partisan, double standard in how the United States government interprets the concepts of national sovereignty and international law. Daniel Patrick Moynihan famously once said that everyone has a right to their opinion, but not to their own facts. Too often in the past, the American government has interpreted the facts of international law to suit US foreign policy. Now, in the Age of Trumpism, we have ignorance and categorical lies, coupled with American’s tradition of selective history and the selective application of International norms. On May 21, 2018, Mike Pompeo made his first formal comments on Iran since President Trump announced his intent to withdraw from the party agreement was negotiated by the P5, the European Union, and Germany with the Islamic Republic of Iran. Seven sovereign nation-states and a non-state actor worked on the 2015 Iran Nuclear Deal Framework, and now the United States is taking its proverbial ball and going home. More ignorance of international norms. Candidate Trump, President-Elect Trump, and President Trump have all repeated ignorant and categorical lies, such as stating that President Obama sent millions in US currency to Iran, without either understanding or articulating that the transfer was a return of Iranian assets frozen since the Iranian Hostage Crisis. The return of those frozen assets (+interest) was part of the negotiated Framework. President Trump and Neocons, like Bolton, as well as Tea Partiers, like Pompeo, seem to think that negotiation is when everyone else agrees with you. The international community has done that before, it’s called the Treaty of Versailles. And, thanks to the Treaty of Versailles, we got Hitler, Nazism, and World War II. A successful treaty is a negotiated agreement in which each side gets something and, frankly, no one is happy. That’s called diplomacy. Total warfare may work in military combat, but it always fails in international diplomacy. Let’s go back to Pompeo’s visit to the Heritage Foundation today; in the 16th paragraph of his speech, Pompeo said that, after complying with US demands, Iran will be welcomed back into the “League of Nations.” Yup. He said the League of Nations. And please don’t tell me that it’s an expression, take a look at the text of the speech, League of Nations was capitalized. Who the heck is his speech writer? If it was meant as just an expression, who is the editor? Who released the text of the speech to the public? Did the Secretary read his speech before he arrived at the Heritage Foundation today? Did *he* notice? I dunno, should someone tell, or have told, the top diplomat of the most powerful nation-state on Earth, the United States Secretary of State, …that the League of Nations does not exist anymore? For some reason, I personally feel that he should have known that already. Yes, on May 21, 2018, the top diplomat of the United States of America said that the US will “crush” Iran. Crush. Yes, the new-normal for diplomatic parlance. And, in the same speech, the chief diplomat referred to the League of Nations that has been defunct for 72 years. Yes, my criticism of Donald Trump’s leadership style is already on record. I do not appreciate the debased new-normal of abusive language in our political rhetoric, as well as the arrogance and, in my opinion, ignorance of the President and his Administration. The President’s has a petty Obamaphobic hang-up and a dangerous and self-indulgent interpretation of historical facts. The President has surrounded himself with washed-out neocons like John Bolton and Tea Partiers like Mike Pompeo. Pompeo, like Rex Tillerson, is highly qualified for many offices like the CIA and the Pentagon. But the leader of the State Department is a Warhawk who promises to “crush” Iran until it rejoins the 72-year defunct League of Nations. The US policy toward Iran is three comprised of pettiness, ignorance, and arrogance. Apparently, one the one hand, Obama gave the cow away to Iran, but it’s the Art of the Deal to sit down with Kim Jung Un. What’s good for the goose, is good for the gander. No, no one knows what the future holds for Iran or North Korea, but US negotiations with the PLO and the IRA seem to have gone well. US normalization of relations with Vietnam and Libya seem to have gone fairly well too. The fact is that the Iranians will have nuclear weapons if they want… maybe not this year, or the next, maybe not in 5 years, but you can’t stop it permanently. It’s called cultural diffusion. The British couldn’t prevent Samuel Slater from bringing the Industrial Revolution to America, nor could America stop the transfer of electronics technologies to East Asia. More to the point, the US and its allies were unable to stop the proliferation of nuclear weapons to Russia, China, India, Pakistan, or North Korea. But few Americas fear waking up to nuclear war with the UK, France, India, or even China or Russia. So, the issue is not nuclear proliferation, its the relationship that the United States has with other nuclear power that matters most. No, the US government cannot permanently prevent Iran from developing a nuclear bomb forever, but the US can manage the US-Iranian relationship so that in ten years Iran is not an enemy. Perhaps its time to let go of Zero Sum politics, the hypocritical application of international norms, and Obamaphobia? Perhaps Obama’s engagement and negotiation with the Iranians is as valid as Trump’s engagement and negotiation with the North Koreans? My name is Tom Keefe, and, remember, Today’s Tomorrow’s Yesterday! Each sovereign nation-state has the right to determine its own capital. The Israeli government has declared Jerusalem to be its capital, therefore the US Embassy should be in Jerusalem. Israel’s legal authority of both West Jerusalem and East Jerusalem are questionable. In 1923, the Treaty of Lausanne recognized British authority for the Mandate for Palestine. This was a result of the defeat of the Central Powers (specifically the Ottoman Empire) in World War I, and the subsequent collapse of the Ottoman Empire as a functioning nation-state. Thus, the legal jurisdiction of Israel-Palestine belonged to the United Kingdom of Great Britain and Northern Ireland as a mandate under the League of Nations and international law. On November 29, 1947, the United Nations (the successor regime to the League of Nations) adopted the Plan as Resolution 181(II), which recommended the creation of independent Arab and Jewish States and an international authority for the city of Jerusalem. 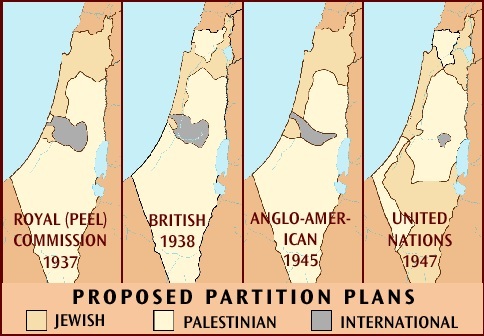 This UN Partition Plan for Palestine recommended a partition of Mandatory Palestine at the end of the British Mandate. The resolution also recommended the creation of independent Arab and Jewish States and a Special International Regime for the city of Jerusalem. The Jewish Agency accepted the proposal with reservations, but the Arab Commission argued that partition violated the principals of national self-determination in the UN Charter which granted people the right to decide their own destiny. Almost immediately after adoption of the Resolution by the General Assembly, a low-level civil war broke out and violence occurred by both religious groups. Adding to the complexity of the situation, post-World War II emigration of European Jews to the British Mandate for Palestine continued, which altered the population ratios in the Mandate. On May 14, 1948, Jewish leaders in the Mandate for Palestine issued the Declaration of the Establishment of the State of Israel in defiance of the United Nation as Resolution 181(II) which set the stage for the 1948 Arab–Israeli War (or the First Arab–Israeli War) between the State of Israel and a military coalition of Arab states and forming the second stage of the 1948 Palestine war. In the war, Israeli forces soundly defeated the Arab coalition and took complete control of West Jerusalem. As a result of the war, the State of Israel controlled both the area that the UN General Assembly Resolution 181 had recommended for the proposed Jewish state as well as almost 60% of the area of Arab state proposed by the 1948 Partition Plan, including Jaffa, Galilee, and some parts of the Negev Tel Aviv–Jerusalem road. Transjordan, today known as Jordan, took control of East Jerusalem as well as what was left of the British Mandate, and the Egyptian military took control of the Gaza Strip. At that point in history, at the Jericho Conference of 1948, Egypt and Transjordan could have created a Palestinian state out of East Jerusalem, Gaza, and the rump Mandate, but no state was created. However, because the Israeli control of Jerusalem was a military conquest and violation of UN Resolution 181, the US Embassy was built in Tel Aviv, not West Jerusalem. Fast forwarding to the Six-Day War of June 1967: On June 7, 1967, Israel captured the Old City of East Jerusalem. Again, because the West Bank and East Jerusalem were a military conquest, not a diplomatic agreement, neither US President Lyndon Johnson nor did his eight successors relocate the US Embassy to Jerusalem. The German invasion of Poland, etc.? Wrong. The Japanese invasion of East Asian territories? Wrong. North Korea’s invasion of South Korea? Wrong. Morocco’s invasion of Western Sahara? Wrong. Iraq’s annexation of Kuwait? Wrong. What makes the Israeli conquest of the West Bank and East Jerusalem any different? Nothing under international law, that’s for sure, though I have heard this argument, that Israel was attacked, Israel did not initiate the war, so that makes it different; Essentially, the argument goes that it’s the Arabs fault because they started the war. If one has siblings, then we are all aware of the goading that can go on before conflict. Regardless, however, there is no legal basis for that argument, no international legal caveat that says if you get attacked, you can conquer the world legally…and, finally, it may be worth pointing out that the belligerents in the 1967 War were the nation-states of Jordan and the Arab Republic of Egypt Syria, and not the Palestinian people. Which only leaves this argument to justify the Israeli occupation and annexation of the West Bank: God. Well, specifically, the Torah. Yes, the Jewish holy texts record that God gave the land of Canaan to the Israelites. Unfortunately for Israel’s case before the international community, religious texts are not exactly admissible in international proceedings. After all, would the international community accept the words of Shiva or Krishna as binding legal documents? Do Israeli Jews accept the Qur’an’s legal weight? In fact, didn’t the Allied Commander for the Pacific Theater in WWII, Douglas MacArthur, didn’t MacArthur demand that the head of the Shinto faith, Emperor Hirohito, publicly change/alter/denounce the dogma of that religious tradition that the Emperor was the descendant of the Sun Goddess? It seems that accepting Jewish scripture as an international legal document is playing favorites with world religion. The repatriation of European Jews was a decision made from guilt and cultural prejudice. The decision was made in wanton disregard for the existing Arab population in the British Mandate of Palestine, like European disregard for indigenous populations around the world. The decision is also a complete rejection for the principals of self-determination and territorial integrity spelled out in the Treaty of Versailles. International law cannot, ought not, to be henpecked. So, am I saying that the State of Israel does not have a right to exist? Am I being anti-Semitic? No, categorically, no. That is not what I’m saying. In the first place, there is a difference between de juro and de facto. For example, when the convention of delegates that was assembled in Philadelphia 1787 was charged with revising the Articles of Confederation, not replacing the US government; the Articles themselves states that the Articles could only be altered unanimously, but only 12 of the 13 states participated in the Constitutional Convention. So, what, we’re now going to abolish the US Government? No, of course not. And, if that point doesn’t seem to have merit, let’s try an analogy. If the Native Americans rose up from every reservation and from all corners of the current United States, if Native Americans took up arms and waged war against the European-American population of the United States, would that be legitimate? After all, like the Jewish people, this land was Native American first. Again, there seems to be an inherent bias in how many Americans perceive the Palestinian-Israeli Conflict. In addition, too many Americans, Israelis, and Palestinians view the situation as a Zero-Sum Game. In game theory and economic theory, a zero-sum game a situation in which each participant(s) gain or loss of utility is exactly balanced by the losses or gains of the utility of the other participant(s). That’s not the only option. The falsity and limitation of Zero-Sum thinking is pointed out by the Nash Equilibrium, and perhaps more importantly, by Positive-Sum thinking. One of the falsehoods in the general discussion of the Israeli-Palestinian Conflict is the binary belief in Identity Politics. No, not all Israelis are opposed to the Two-State Solution; many Israelis recognize the dehumanizing conditions in the West Bank and Gaza Strip. And no, not all Palestinians are supporters of violence who deny the right of Israel to exist. Remember Israeli Prime Minister Yitzhak Rabin was assassinated by a Jewish murderer, not a Palestinian terrorist. If it seems that Palestinians are more angry and expressive of their feelings, ask yourself who was more angry and expressive in the American Civil Rights movement. The United States has often neglected its potential as an arbiter for peace in the world, but not always. The American-brokered Good Friday Agreement is an example of US leadership in the world. Peace can happen when Americans recognize the right of both Palestinians and Israelis to self-determination. Peace can happen when settlements on the West Bank are not being constructed at the same time supposed negotiations occur. Peace can happen when the United States spends as much financial aid for Palestinian schools, hospitals, and police-training, as it sends in military hardware to Israel. And, finally, peace will happen when Palestinians reject the politics of violence, and Israelis embrace the politics of humanitarianism. The enemies of peace abound. They exist in the profit margins of the American military-industrial complex, and hidden corners of the Israeli government chambers; the enemies of peace exist in some of the madrasas and mosques of the West Bank and Gaza, just as much as they exist in the pulpits of many American Christian churches and some of the yeshivas of Israeli and America. Yes, West Jerusalem is -and should be- the capital of Israel. But East Jerusalem should also be the capital of a Palestinian State as well. Opening one embassy, not two, was an expression of Zero Sum politics and an abdication of American leadership for peace in the world. On May 14, 1948, Jewish leaders in the Mandate for Palestine issued the Declaration of the Establishment of the State of Israel in defiance of the United Nation as Resolution 181(II)… setting the stage for the 1948 Arab–Israeli War (or the First Arab–Israeli War) between the State of Israel and a military coalition of Arab states, and forming the second stage of the 1948 Palestine war. Dwight D. Eisenhower, President of the United States for two full terms, “minimized relations with Israel, but he did not reduce the U.S. commitment to the existence and survival of Israel” (Source). Lyndon B. Johnson, President of the United States for approximately 6 years, ordered the U.S. 6th Fleet, previously sent on a training exercise toward Gibraltar, to be re-positioned to the eastern Mediterranean to be able to assist Israel during the Six-Day War of June 1967. On June 7, 1967, Israel captured the Old City of Jerusalem. On June 8, 1967, Israeli Air Force jet fighter aircraft and Israeli Navy motor torpedo boats attacked the USS Liberty, an American naval research ship incident. Richard Nixon, President of the United States for almost two full terms, did not move the US Embassy to Jerusalem. Gerald Ford, President of the United States for approximately 3 years, did not move the US Embassy to Jerusalem. In June 1976, a UN proposal supporting the two-state solution based on the pre-1967 lines was vetoed by the United States. Jimmy Carter, President of the United States for a full term, did not move the US Embassy to Jerusalem. On September 17, 1978, following twelve days of secret negotiations at Camp David, the Camp David Accords were signed by Egyptian President Anwar El Sadat and Israeli Prime Minister Menachem Begin. Ronald Reagan, President of the United States for two full terms, did not move the US Embassy to Jerusalem. In 1987, Jonathan Pollard, a former US intelligence analyst, pleaded guilty to spying for and providing top-secret classified information to Israel. On November 15, 1988, Palestinians declared the Palestinian Declaration of Independence, which referenced the UN Partition Plan of 1947 and “UN resolutions since 1947” and was interpreted as an indirect recognition of the State of Israel, and support for a two-state solution. George H. W. Bush (41), President of the United States for a full term, did not move the US Embassy to Jerusalem. From October 30th to November 1, 1991, Spain hosted the Madrid Conference (co-sponsored by the United States and the Soviet Union), to revive the Israeli–Palestinian peace process through negotiations, involving Israel and the Palestinians as well as Arab countries, including Jordan, Lebanon, and Syria. Bill Clinton, President of the United States for two full terms, did not move the US Embassy to Jerusalem. In 1993, the Oslo I Accord, an agreement between the Government of Israel and the Palestine Liberation Organization, was signed in Washington, D.C. In September 1995, the Oslo II Accord, an agreement between the Government of Israel and the Palestine Liberation Organization, was signed in Washington, D.C.
October 28, 1995, the Jerusalem Embassy Act of 1995 was passed by the US Congress. President Clinton, however, did not move the US Embassy to Jerusalem at any point in his for two full terms as president. In 2000, US President Bill Clinton convened a peace summit between Palestinian President Yasser Arafat and Israeli Prime Minister Ehud Barak. In May of that year, according to Nathan Thrall, Israel had offered Palestinians 66% of the West Bank, with 17% annexed to Israel, and a further 17% not annexed but under Israeli control, and no compensating swap of Israeli territory. The Israeli prime minister reportedly offered the Palestinian leader approximately 95% of the West Bank and the entire Gaza Strip if 69 Jewish settlements (which comprise 85% of the West Bank’s Jewish settlers) be ceded to Israel. East Jerusalem would have fallen for the most part under Israeli sovereignty, with the exception of most suburbs with heavy non-Jewish populations surrounded by areas annexed to Israel. The issue of the Palestinian right of return would be solved through significant monetary reparations. According to Palestinian sources, the remaining area would be under Palestinian control. Depending on how the security roads would be configured, these Israeli roads might impede free travel by Palestinians throughout their proposed nation and reduce the ability to absorb Palestinian refugees. Borders, airspace, and water resources of the Palestinian state would have been left in Israeli hands. President Arafat rejected this offer and did not propose a counter-offer. No tenable solution was crafted which would satisfy both Israeli and Palestinian demands, even under intense U.S. pressure. Clinton blamed Arafat for the failure of the Camp David Summit. In the months following the summit, Clinton appointed former US Senator George J. Mitchell to lead a fact-finding committee that later published the Mitchell Report. George W. Bush (43), President of the United States for two full terms, did not move the US Embassy to Jerusalem. In July 2002, the “quartet” of the United States, the European Union, the United Nations, and Russia outlined the principles of a “road map” for peace, including an independent Palestinian state. The roadmap was released in April 2003 after the appointment of Mahmoud Abbas as the first-ever Palestinian Authority Prime Minister. From December 2006 to mid-September 2008, Israeli Prime Minister Ehud Olmert and President Mahmoud Abbas of the Palestinian Authority met 36 times; there were also lower-level talks. In 2007 Olmert welcomed the Arab League’s re-endorsement of the Arab Peace Initiative. In his bid to negotiate a peace accord and establish a Palestinian state, Olmert proposed a plan to the Palestinians. The centerpiece of Olmert’s detailed proposal is the suggested permanent border, which would be based on an Israeli withdrawal from most of the West Bank. Olmert proposed annexing at least 6.3% of Palestinian territory, in exchange for 5.8% of Israeli land, with Palestinians receiving alternative land in the Negev, adjacent to the Gaza Strip, as well as a territorial link, under Israeli sovereignty, for free passage between Gaza and the West Bank. Israel insisted on retaining an armed presence in the future Palestinian state. Under Abbas’s offer, more than 60 percent of settlers would stay in place (not return). In December 2008, Ben-Ami Kadish, a former U.S. Army mechanical engineer, pleaded guilty to being an “unregistered agent for Israel,” and admitted to disclosing classified U.S. documents to Israel in the 1980s. Barack Obama, President of the United States for two full terms, never moved the US Embassy to Jerusalem. On October 19, 2009, Stewart David Nozette was arrested by the FBI for espionage. Nozette, an American scientist for the United States Department of Energy, the United States Department of Defense, DARPA, the United States Naval Research Laboratory, and NASA. At trial, Nozette admitted attempting to sell U.S. classified information to someone he believed was an Israeli Mossad operative. He was convicted for attempted espionage and fraud against the United States. In September 2010, the Obama administration pushed to revive the stalled peace process by getting the parties involved to agree to direct talks for the first time in about two years. On July 29, 2013, United States Secretary of State John Kerry attempted to restart the peace process through direct negotiations between Israel and the Palestinians. On December 6, 2017, US President Donald J. Trump, ordered the relocation of the US Embassy in Israel to Jerusalem, on his 320th day in office as President of the United States, with no connection to any direct talks, negotiation, or peace plan. At what point does a nation have the right to go to war without the blessing of the international community? Russia did not ask anyone if it could go to war with Chechnya or Afghanistan. Yet, Russia was adamantly against the use of force in Iraq. Jordan, Syria, and Egypt never asked permission to invade Israel. Did the United Kingdom ask permission to retake the Falkland Islands, when Argentina declared they wanted them back? Do you think that China will go before the U.N. to annex Taiwan? Interesting points, but I would question comparisons to other wars. 2) The invasion of Afghanistan was an unjust, aggressive war perpetuated by a declining power in order to artificially mask internal problems and project a greater sphere of influence forcibly. The current government of Russia, while it has not made a complete break from its past is a significantly different country…would you say it was inconsistent for France to resist Nazi aggression since France itself sought to aggressively conquer Europe under Napoleon? I wouldn’t. 3) When Egypt, Jordan, and Syria invaded Israel, there was no “Israel” sort-of-speak…Israel was a paper creation of non-Middle Eastern powers by imposing UN Resolution 181. Nearly every new country was created by a conflict with its neighbors and/or previous owners of the land (perhaps with the exception of the Czechoslovakian Velvet Revolution). Of course, they wouldn’t ask the UN, since it was the UN which had imposed Israel on the Middle East. 5) As for any possible mainland Chinese invasion of Taiwan, no China would not ask the UN because (as in the case of Chechnya) the tension between mainland China and Taiwan is technically an internal matter. In fact, there is no country in the world that recognizes both “countries,” even the UN itself recognizes only one. Most importantly though, the invasions of Chechnya and the Falkland Island were a response to attacks by the Chechnyans and Argentinians respectfully. Therefore it is nearly impossible to compare these conflicts to the Iraq War in which there was no prior attack by Iraq. Also, we did not fight Vietnam alone. How about Australia, New Zealand and The Republic of Korea? Likewise, we are not going it alone in Iraq. How about Australia, England, Spain, Italy, Poland, Czech Republic, and Japan? Saying the United States is fighting alone is misleading. The United States is not going it alone; it is going it without the United Nations and there is a difference. Just throwing some food for thought out there. Nothing personal. Technically you are correct and so I obviously agree with you. On the other hand, it is my understanding that when the comment “going it alone” is made, it is meant figuratively rather than literally. Waltz (p.302) points out that at any given point, there are only eight powers. Only one of the world powers backed the US invasion, while the others opposed it. One of the best differences between the two coalitions in 1990/91 versus 2003 is that in 1990 the US received active military support from regional (and Muslim) powers. No regional powers or countries gave any military support to the war in 2003. Turkey, a member of NATO, even refused the US access to Iraq through Turkey. I also don’t believe the US use of force in Iraq is not deterrence because Art goes on to say that “If a threat has to be carried out, deterrence by definition has failed” (Kaufman, p.81). I believe Art would call the Iraq War compellence, not deterrence. Finally, I agree with the basic problem you’ve identified…”At what point does a nation have the right to go to war without the blessing of the international community?” It seems to me that there three types of war: formation, aggression, and defense/response. The US has fought eleven major wars and I would divide them as follows: Formation (AmRev, 1812, Civil War), Aggression (MexAm, SpanAm, Vietnam, Iraq), and Defense/Response (WWI, WWII, Korea, Persian Gulf). Few people question wars fought (if it’s successful) or in defense/response. Nor do I believe a country needs international blessings. But to initiate an aggressive war without an international blessing is what seems questionable. Fair or not, the comparisons between Vietnam and Iraq start early in that they were both begun with lies…The Tonkin Gulf Resolution and Colin Powell’s Presentation to the UN.